Happy New Year, I hope you all had a blessed Christmas and a restful New Year. It was great spending time with my Mum (who is unwell), family and friends. Welcome the following our two new staff members: Sarah Robertson and Philippa Barling. We have a number of New Students and Families that I would like to acknowledge and welcome – Kyrene Anonuevo, Louis Arbuckle, Ellery Balderas, Mateo Lopez, Freddie Rea, Charlotte Kendrick, Leo Nicholls, Arran & Luca George, Samuel Pabon, Xavier Robertson, Diego Bagworth, Madeleine Snell and Mich Duan. This year our major focus is on Digital Technologies and Te Reo. These subjects will be integrated through all other curriculum areas. To know more about what is happening in our school please attend our Learning Evening on Monday 04 February (read details below). We will have a picnic together 5 p.m. to 5.55 p.m. (the PTA will be selling refreshments and food). Then at 6 p.m. and 6:30 p.m. there will be two identical sessions where teachers will share information that is specific for their Year groups. E.g. Learning expectation, learning targets, timetables, homework, and new initiative. Children can attend the sessions with you or they may continue playing (we will have teachers supervising). The meetings rooms are as follows: Room 2 for Students in Rooms 1 & 2; Room 4 for Students in Room 3 & 4; Room 5 for Students in Rooms 5 & 6; Room 7 for Students in Rooms 7 & 10; and Room 8 for Students in Room 8 & 9. I look forward to meeting you all. PTA Meeting Tonight in the Staffroom at 7pm – You are all warmly invited to attend. Wearing of Sunhats is Compulsory for Terms 1 and 4 – Students who do not bring their hats need to stay in the shade. The Independent Taskforce engaged widely with stakeholders throughout 2018 as part of their review of Tomorrow’s Schools. During this time they identified a number of common themes, which led to a report that covers eight key issues; governance, schooling provision, school competition and choice, disability and learning support, teaching, school leadership, resourcing and central government agencies. The Report – Our Schooling Futures: Stronger Together /Whiria Ngā Kura Tūātinitini – makes a number of significant recommendations for changes to the current education system. Feedback on the report and its recommendations will be critical to inform Government decision making in 2019. 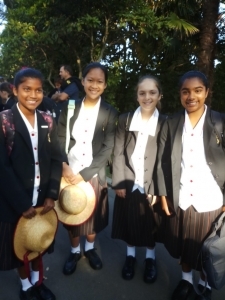 Recognise that Catholic Schools are integral participants in the evangelising mission of the Church, a Catholic School will ensure students receive a quality holistic education that fosters: a genuine encounter with Christ; growth in knowledge of Christ, His teachings and the teachings of the Church; opportunities to become authentic witnesses of their faith. Parish Newsletter – The Parish Newsletters will start again soon so have a look to keep up-to-date with what is happening in our parish. May the blessing of simplicity be ours, of truthfulness of being, of joy and trust, of humility and open hearts and may we be a blessing to all with whom we meet this day! Amen”. Welcome to SMCS for both new and returning families. I hope you have all enjoyed the holidays and are ready to send your children back to school. The Board of Trustees (BOT) have an important year in front of us with the BOT elections to be held in May this year. Regardless of whether you want to make a difference for your children, give back to the community or have other motivations, please feel free to get in touch with me to understand the role you could play in the school’s future. 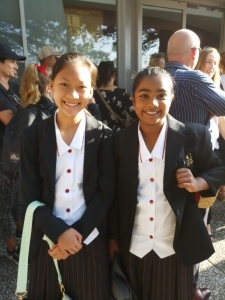 In the past week we have received amazing news to start the year – the School Hall loan of just under $600,000 has been paid off by the New Zealand Catholic Education Organisation (NZCEO) and the Auckland Catholic Diocese. This is a fabulous result and reflects the hard work and many hours lobbying by both the Parish, and past and present BOT members. As a school community we have been focused on reducing this debt through a combination of the Building Fund Contribution included in the school fees and PTA fundraising. We can now redirect our focus and energy into developing the school consistent with our 2018 Masterplan (scroll to SMCS 20 Year Property Plan). This amazing news also means that the Building Fund Contribution of $420 per family will not appear on your 2019 school fees invoice. However it is timely that the BOT review the school fees for the calendar year. The BOT contribution of $990 per child has not increased since 2012 and therefore hasn’t kept up with inflation and the cost increases associated with running our school. As a result the school fees have been increased by $40 to $1,030 per child. 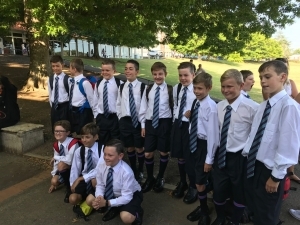 On Wednesday 12th of December after prize giving and the Christmas concert the boys had their summer soccer final. The did really well and were the grade winners of the Summer league, 4 aside, 6 & 7 Grade! It was a fantastic final and they were all so thrilled with their achievement. 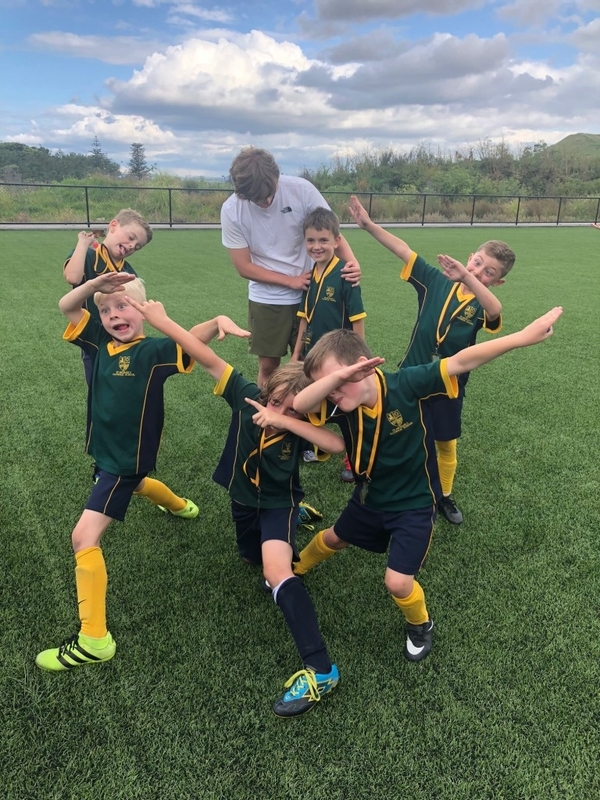 The team members were: Ollie Coombe, Jonty Fisher, Samuel Luxford, Joshua Carran, Zane Naoum and Alfie Glennie. 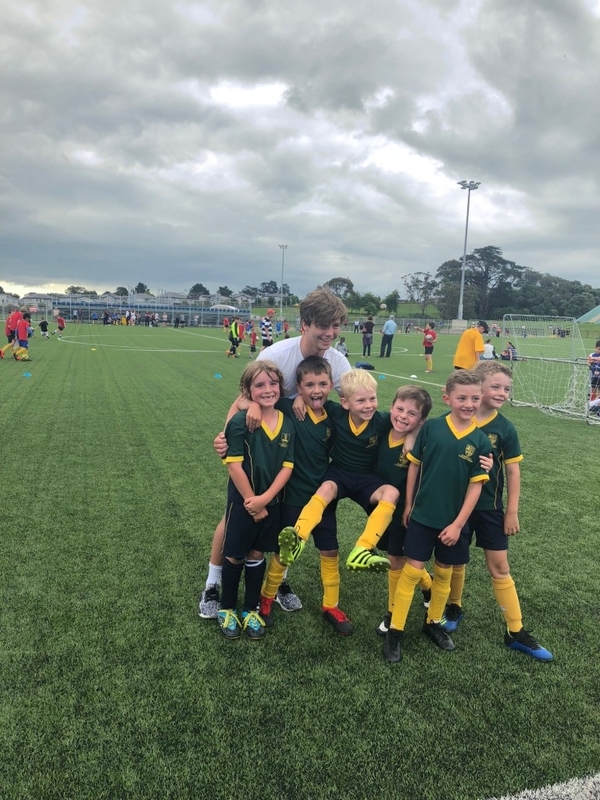 Ollie’s big brother Sam (a SMCS old boy) was the coach which was lovely. Welcome back to school for another exciting year for the families of St Michael’s. The PTA have hit the ground running this year with their first meeting taking place tonight in the staff room at 7 p.m. – all parents are welcome to attend! We have a fantastic year planned and need your support throughout the year to make 2019 a success! The PTA are looking forward to welcoming parents on Monday night at the Teacher Information Night and back to school picnic taking place on Monday 4 February from 5 p.m. to 7 p.m. The PTA will be selling refreshments and food from the hall kitchen so you can take the night off! There will also be an information stand in the hall foyer if you would like to know more about the PTA and how you can help. We will be standing in front of the St Michael’s Family Tree! The St Michael’s Family Tree, At the end of last year we launched our campaign to replace the existing St Michael’s Family Tree in the Hall foyer. For those that missed this information, here is a recap to inspire you. In 2010, contemporary artist and St Michael’s parent, Peata Larkin created a Maori design for the entrance wall in the foyer of the schools St Mary Mackillop hall. This beautiful piece of artwork features a stylised tree motif representing the St Michael’s family. The tile wall was a wonderful opportunity for our community to be a part of history by purchasing a named tile. This formed one of the vital fundraising initiatives to raise funds to build the existing hall. Unfortunately, the tiles have not weathered well and the PTA with Peata’s help will be endeavouring to replace the existing tiles with ceramic tiles that will stand the distance of time. It was always Peata’s vision to have ceramic tiles, so now with the support of sponsors we will be able to replace the laminex tiles with ceramic tiles. All tiles that were purchased in December 2009, will be replaced free of charge. Those families will be contacted over the coming months and will be provided the opportunity to put the years their family attended St Michael’s on their tile. New families to the school and parish will now have the opportunity to purchase a named tile. By purchasing a tile your family will become a part of this unique artwork that brings together the past, present and future of our very special school community. This new tile wall is going to be constructed by Peata in March and will be unveiled on Friday 5 April 2019 at a wonderful gala event called “A Night on the Tiles”. Watch this space for more information about the entertainment line up and ticket prices. Our Secondhand Uniform Shop will be opened this Friday, 1 February from 2.30 p.m. to 3.15 p.m. Please note the shop is opened the first Friday of every month. Please visit the ladies underneath the Senior Block to grab a bargain to take care of your uniform needs for Term 1. Please note there is no Pizza or Ice blocks being sold this Friday, this service will commence next week,Friday 8 February. These are sold from the hall kitchen every Friday and can be purchased for $2 each. Last year the PTA raised over $7,000 from this fundraising initiative and with that money we were able to replace the shade sale for the Senior Playground. Thank you for your continued support in 2019. Thanks so much to those who collected stickers and bag labels in 2018. We managed to get over $900 worth of sports equipment for the school. Please start collecting the stickers today. Please place full sheets in the PTA box outside the office. The East Auckland Weet-Bix TRYathlon will take place on Sunday 10th February, at Point England Reserve. Registrations close on 7th February. Participants need to be aged 7 – 15 years old. You can register and enter our school group here. By linking to our school group it will give us the chance to win some cool prizes! https://www.registernow.com.au/secure/Register.aspx?E=31836&G=78946The TRYathlon is all about giving it a TRY and is rewarding and fun day out for everyone.If you have any school related questions please contact our school coordinator Laura Thomson on laurajanethomson@gmail.com or 021880651. For those who have not taken part before and would like to check out the course, meet Laura and some of our participants at Point England for a quick walk through on Sunday 3rd at 4pm. We are looking for a parent to take on the role of co-ordinating soccer at SMCS. It involves organizing the teams and liaising with Ellerslie Football Club. Nico Buyck who has done this role for numerous years will be on hand this year to guide you through. Please contact Deahna on deahnamaree@gmail.com if interested in this volunteer role. Children’s Liturgy takes place most Sundays during 10 am Mass in school term time. About 25 minutes. Our aim is for children to receive the Word of God at a level of understanding for their age and to discover its meaning in their lives, whilst giving parents/carers the opportunity to remain in the church and hear the Word of God themselves. Our numbers are very low so we are in need of leaders and helpers for this Ministry. Please email Susan Woolley ceramicaitalia@xtra.co.nz if keen or would like to find out more information. We are looking for people to help out once or at most twice a term, You will be supported and teamed up with an experienced leader. The children who attend really enjoy it and you would be helping them on their spiritual journey.